I picked a sunny day to cycle Post To The Coast art trail. 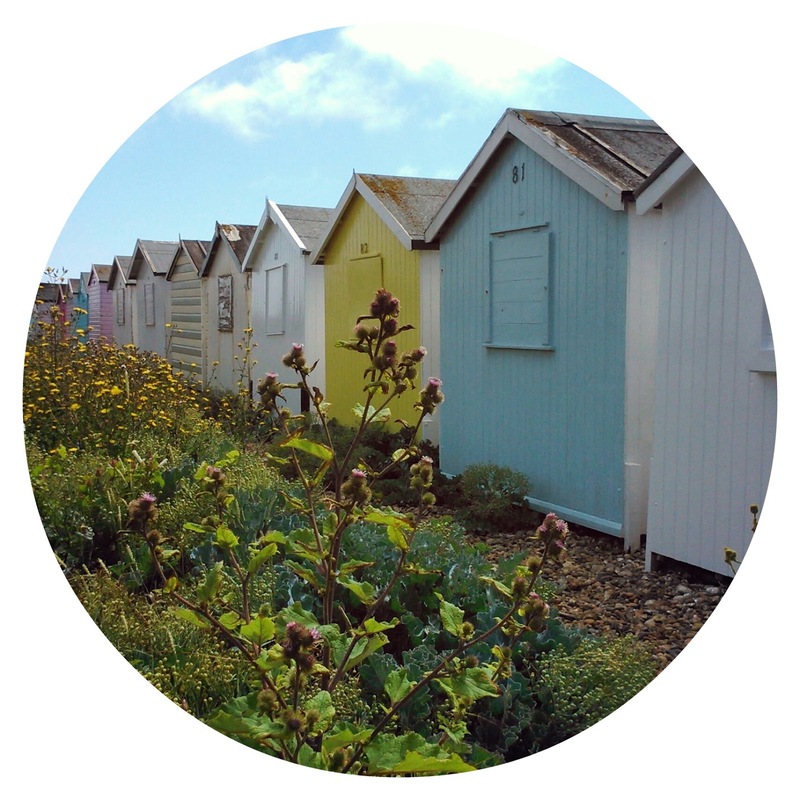 An evolving heritage project by Creative Waves Community Arts, this year-long coastal trail covers a 6 mile route starting at Worthing Lido's traditional English seaside sweet shop and ends at the corrugated steel Nissen Hut at Shoreham Fort. The trail shows artwork, seaside memories and poems inspired by postcards featuring the Sussex coastline. 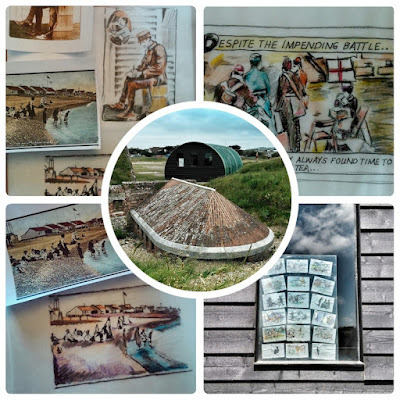 Having taken part in early research workshops for the project investigating historical postcards at Worthing Museum, and subsequent art workshops at Shoreham Fort, I was keen to experience the whole trail. 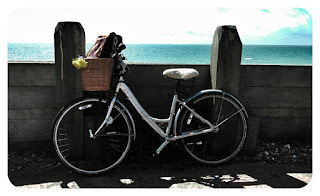 A bright sunny day with a westerly wind blowing towards Shoreham made cycling an ideal way to cover the entire route. 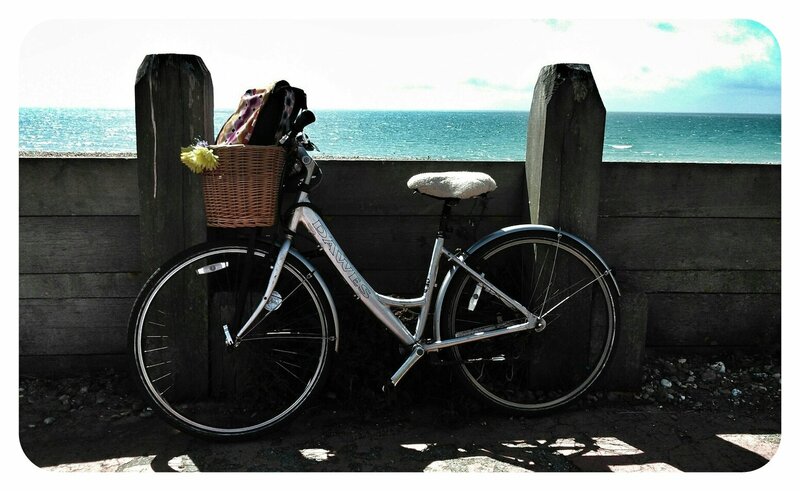 Proceeding at a leisurely pace on my upright trusty Dawes bike and stopping to look and think along the way, it took me 2 hours to complete the trail. 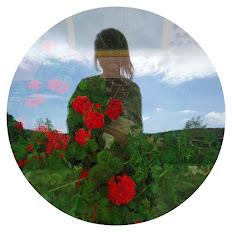 I'd looked at the interactive trail map before setting off, so had an idea where the artwork would be, but still found it exciting each time I saw a new piece of art or an information post containing a story or a bygone holiday memory. 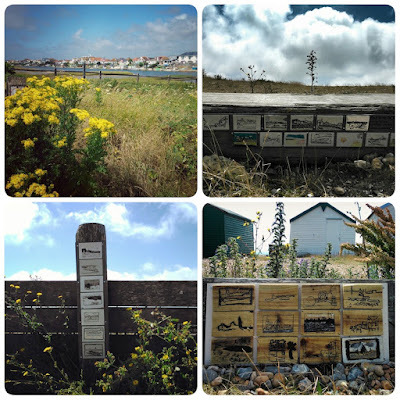 The section along Lancing seafront from Beach Green to Widewater Lagoon is superb, with artwork hung along the slatted wooden walls defining the beach. 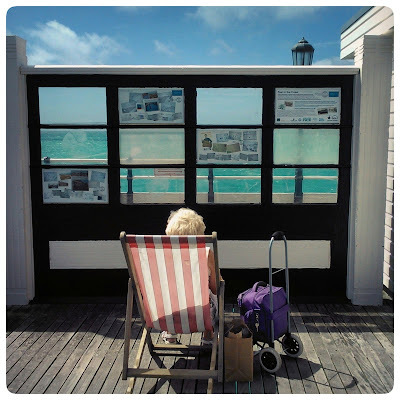 This is a perfect place to view art and contemplate the history of the area with ever changing skies and sea as a backdrop – an invigorating experience for the senses. 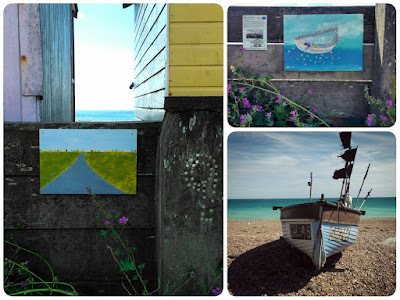 I was thrilled to discover my own drawn postcard (above) installed on a weathered wooden wall alongside the beach huts at the end of Lancing Beach Green. Another personal highlight was at Shoreham Beach's Old Fort Road where a row of painted wooden postcards hang along a fence outside a corner house (on Ferry Road). 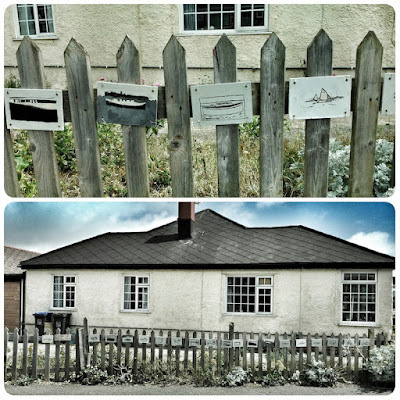 These 19 simple, beautiful images are reminiscent of Alfred Wallis and were made by students at Shoreham Academy - a must see. 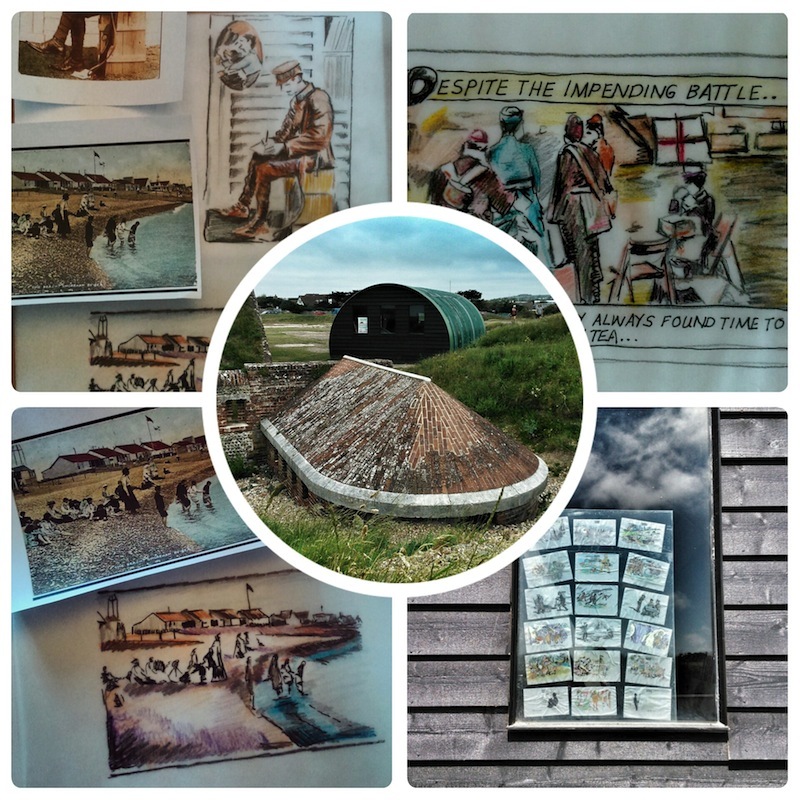 Finally arriving at Shoreham Fort I found artwork hung on the side of the wooden postbox and in the rear windows of the Nissen Hut, where my drawings are also on display alongside some poignant pieces made by fellow artists at the Creative Waves Wednesday Fort workshops. 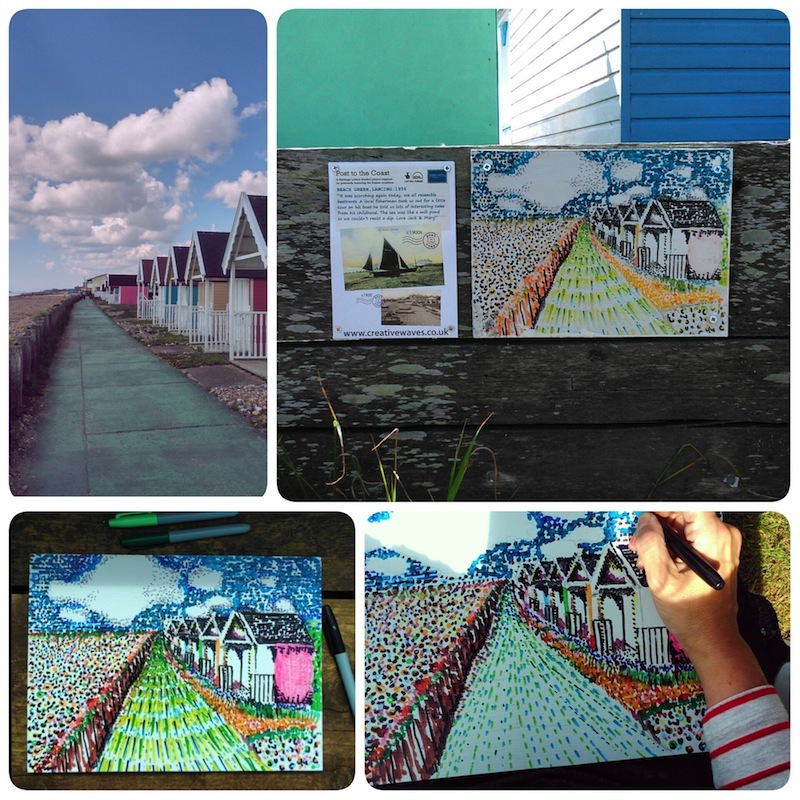 Post To The Coast trail will continue to grow throughout the year and visitors are invited to share their own Sussex seaside memories and contribute postcard artwork. 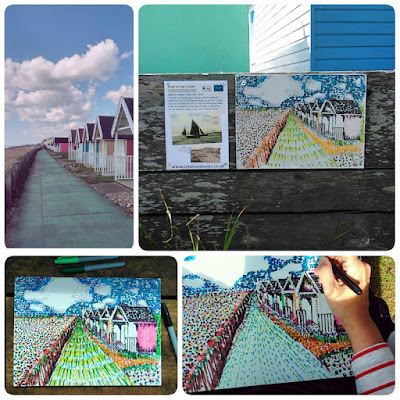 Free trail maps and postcards are available along the route (and at Worthing Museum), and information on how to take part can be found at Creative Waves.